I performed “Where the Wild Things Are” for Eliott’s 3rd birthday party. I recruited friends and family to play the part of the wild things. 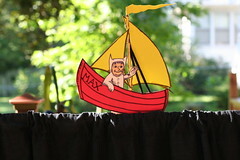 Here’s Max in his boat.